← Why are Some Drugs Rare? Well Future Pharmacy makes medication compounding in Michigan Avenue, Chicago, Illinois available for various patients and medical practitioners looking for medications that need to be customized. Instead of saying we make drugs, it is more appropriate to state that we “modify” an available medication in the market to suit the needs of the customer. Compounding is entirely different than manufacturing a drug, and we will dedicate this blog to looking into every nook and cranny regarding the difference between the two. Let us first start by providing the meaning of both words. In short, manufacturing is creating a product using raw materials and selling the new product in the market. 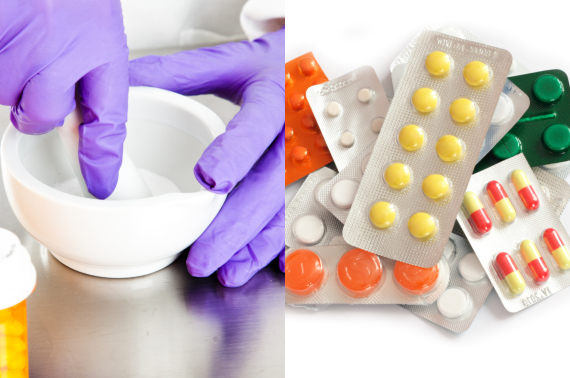 Both pharmaceutical manufacturing and compounding involve drugs. But the line that divides them is the fact that in manufacturing, raw materials are utilized in order to make a product. However, compounding involves using already-made drugs, adding or removing ingredients and dosage forms, possibly including the alteration of medication forms. We look into the guidelines for differentiating compounding and manufacturing. This guideline is mostly used by pharmacists and other professionals in order to distinguish the mentioned terms. The essence of the prescription. Before compounding, it is absolutely necessary to create a relationship between the patients, the compounding pharmacist, and the prescriber. The patient should first consult a medical expert in order for a prescription to be provided. This prescription will be the guide of the compounding pharmacist in making the customized medication. This is what it means to make a pharmacist-patient-prescriber relationship existing. Individual state boards of pharmacy. Our country is under a sovereign body and this body is here to govern us. If we have a higher authority that will lead us, peace will not be so hard to attain. This is the same in the case of compounding pharmacists. That is why one should not go Frankenstein on compounding medications to prevent unfortunate circumstances. There are some rules in making compounded medications and one of which is not observing resale. Resale happens when a compounding pharmacist sells the customized medication he or she has made to another pharmacy for that pharmacy to sell to customers. This practice is a big no-no because such activity can be associated to an infringement of one’s intellectual property. You can count it as plagiarism in the case of writers. Once a compounded medicine has been made, it should directly go to the patient for his or her personal use. But there is an exception to this. Hospitals can ask the help of a compounding pharmacy to make a modified drug and sell it to their patient. If you are a compounding pharmacy, as in the case of Well Future Pharmacy, you are only allowed to advertise the fact that you are a pharmacy offering compounding services. You are not allowed to tell everyone that your pharmacy has made an ibuprofen that tastes like strawberry or a metformin that can be taken in liquid form. It is essential for pharmacies to be able to follow the rules with regards to compounding to avoid suffering from issues between the manufacturers and the pharmacy itself. For that reason, the pharmacists here at Well Future Pharmacy are careful whenever they provide medication compounding in Michigan Avenue Chicago Illinois. To enjoy our compounding services, visit us at www.wellfuturepharmacy.com. This entry was posted in Compounding Pharmacy, Pharmacy and tagged best compounding pharmacy, compounding, Medicine, pharmacy. Bookmark the permalink.